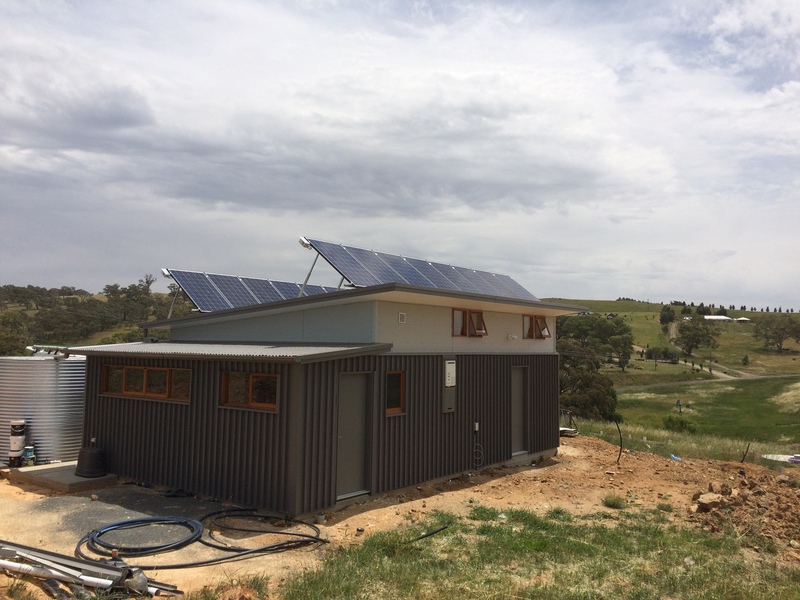 Architect Ian McCaig, and his partner, Liz, purchased an off grid system as part of the Sustainable House Group Buy so they could reduce individual prices by 15%. Ian tells us about his experience in going ‘off grid’. We are building a new home on a 5 acre rural residential block 15km NW of Orange on the Central Tablelands of NSW. The house has been designed using passive solar design principles – good orientation, insulated thermal mass, double glazing, shading. The garage, a free standing structure with a bathroom & kitchenette was completed in October 2015, giving us somewhere to stay when we visit. Construction of the house has now commenced. Grid power is available to the property – an 11,000V line runs in an easement on the western side of our property. A number of things contributed to our decision to go off grid for power (we had no choice for water & sewer). We always intended to install a photovoltaic system, with a view to generating most if not all of our electricity requirements on site. With high daily average sunshine, Australia is ideally placed to utilise solar technology for power generation; generating power it where it is going to be used seems obvious. The feed in tariff paid by the local electricity retailers is around 5c / kWh, the electricity you generate is then sold back to you at night for 29c / kWh. Even if we fed our total energy production back into the grid at these rates, the feed in tariff would not cover the daily service availability charge. It makes sense to store the electricity we generate, rather than selling it to the energy retailers. The connection point to the grid for our block had been located so as to be convenient to serve the adjoining block, but entailed a 190m cable run to the location of our house, a cost of $10,700.00 to connect. Taking these factors into account, we decided to go off-grid for power. We filled in a questionnaire [Load Profile document here] listing all of our electrical devices, their power consumption and estimated daily operating hours, Off Grid Energy then used this data to model our projected daily energy usage and to design a system to suit. One limitation was that our garage roof could only accommodate 16 panels, although the modelling suggested that we may need more to satisfy demand during winter. 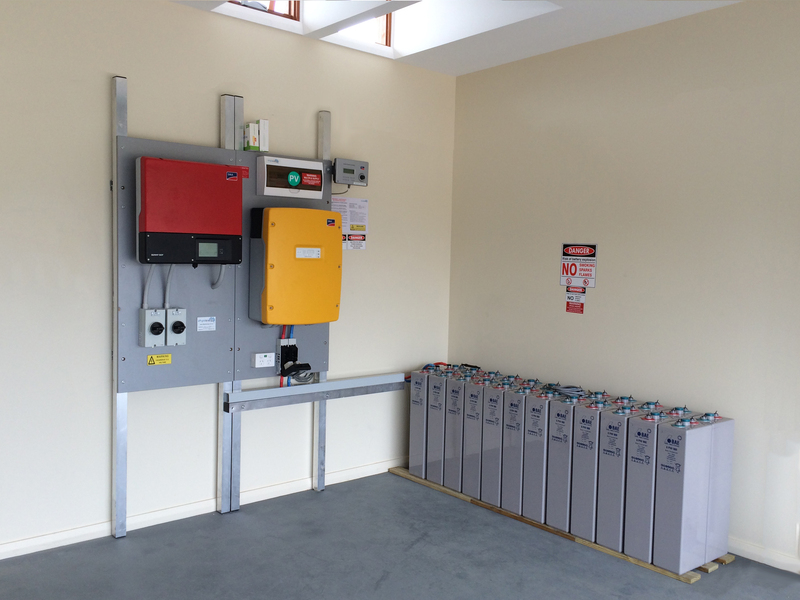 The system installed consists of 16 Tindo Karra multicrystalline solar panels (4.16kW total), an SMA SB-5000TL solar MPPT inverter, 24 BAE sealed gel batteries and an SMA S18.0 Sunny Island inverter / charger. We also have a Honda 5.5kva generator as a backup, it has not been used as yet. Installation was completed late in November 2015. As we only occupy the garage for short periods, we have not taxed the system at all – even with cooking using electric hotplate and running lights, fridge, water pump, TV etc, we have not seen the batteries go below 94% charge. On a sunny morning the system is usually back to 100% by 10:00 am. We can’t currently use the power that the system is capable of producing. Our aerated sewer treatment system is due to be plugged in soon – it will be interesting to see the impact this has. 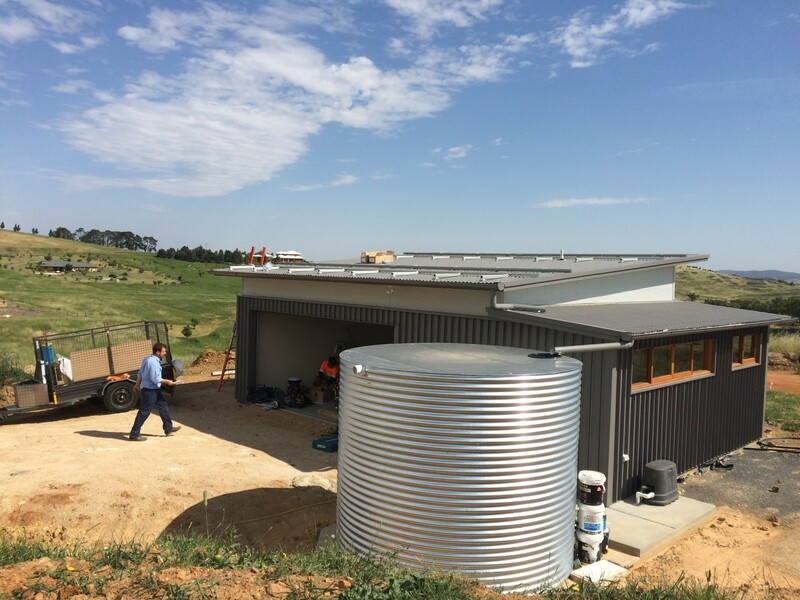 With the house under construction, the builders are using various power tools – brick saw, angle grinder, cement mixer, all running straight from the solar panels & inverter – very satisfying. 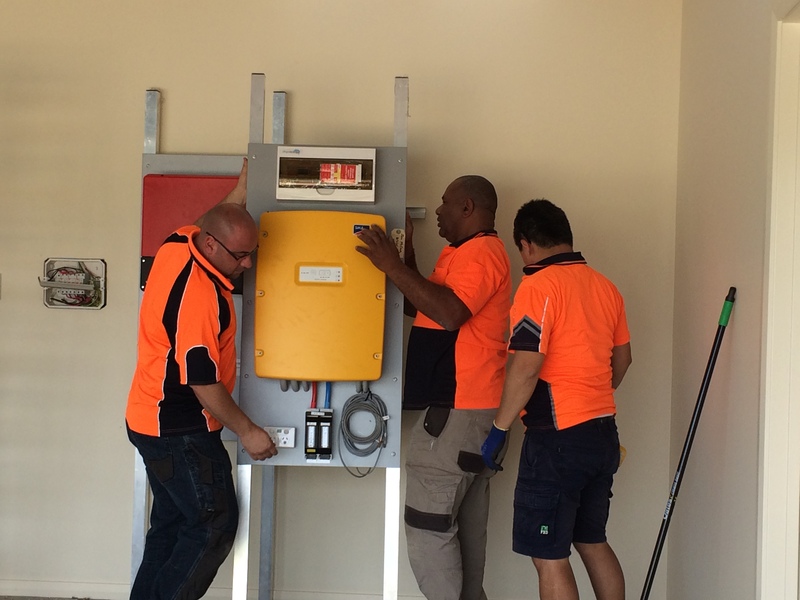 When the house is completed at the end of the year, we will closely monitor the performance of the system to see if we need to add more panels. I look forward to a follow-up article when the house is completed and everything is up and running. I hope to be able to do the same thing in the next couple of years when we build a house on a rural property. looks great but I don’t know the price $. I would like to know as I want to set up a hbrid system 5kw with 5 days automity with the option to use t33 at night to charge battries. and battries tyo smooth out high tariff periods.in the afternoon and evenings. Thanks for your comments. I’ll get one of our consultants to contact you via email with further details.